If you are looking for information on the Peterbrooke Chocolatier franchise business opportunity, Peterbrooke Chocolatier franchises or Peterbrooke Chocolatier franchising, then you have come to the right place. Peterbrooke has captured the appetites and the imaginations of chocolate lovers from around the world. The Peterbrooke recipe for creativity and unsurpassed customer service has helped us transform the art of European chocolate-making into a truly American experience. 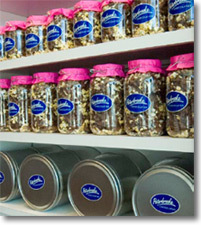 Now we invite you to discover the ultimate chocolate experience - owning a Peterbrooke Chocolatier franchise of your own. It's a once-in-a-lifetime chance to become part of a world that is, in a word, sweet. Phyllis Lockwood Geiger opened the doors to Peterbrooke Chocolatier in 1983, naming it after her two children Peter and Brooke. Her mission was to bring back the art of European chocolate-making and translate it into the American neighborhood experience. As a forerunner in the "gourmet movement," Peterbrooke soon became a celebration of chocolate. From traditional favorites like decadent crèmes and fondants, to modern temptations like popcorn, cookies and pretzels drizzled with chocolate - at Peterbrooke, it's all about creating the ultimate experience. Owning a Peterbrooke franchise is a once-in-a-lifetime opportunity. It's your chance to be part of a family of entrepreneurs who are bringing the Peterbrooke vision to new neighborhoods across the country. 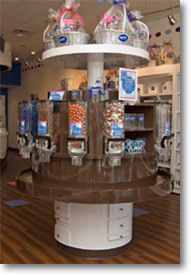 According to the U.S. Department of Commerce, retail chocolate sales in the United States exceed $13.1 billion every year. When experts like Candy Industry Magazine forecast "premium chocolates seem poised to become the next everyday luxury," it's no wonder that Peterbrooke confections are becoming so popular with chocolate lovers of all ages. We are proud to have eight successful company owned locations in northeastern and central Florida and a booming online store. Since 2000 our company stores have more than doubled their sales volume. Peterbrooke was recently named in the Jacksonville Business Journal as one of the 50 fastest growing privately held companies. We have sold 24 stores since 2005. Now, for the first time in history, we are inviting extraordinary individuals to bring our one-of-a-kind experience to neighborhoods across the country. As a Peterbrooke franchisee, you will benefit from the rich history behind our name, as well our dedication to become the preeminent chocolate brand of the future. With a Peterbrooke franchise, the possibilities are delicious. With a Peterbrooke franchise, you have the benefit of a proven business model and a team of experts to keep you on track every step of the way. When you become a Peterbrooke franchisee, you'll receive a timeline that guides you step-by-step through the opening of your store. In addition, Peterbrooke representative will be on-site to assist you with your Grand Opening. And, should you ever require additional assistance, a Peterbrooke executive is always just a phone call away. If you are selected to join the Peterbrooke family, our franchisee training program will prepare you to become a world-class chocolatier. A team of experts will teach you everything you need to know about creating our famous chocolates while having fun in the process. In addition, we'll show you how to operate your retail business to make the most of your sales and profits. Each franchisee will also receive a Peterbrooke Master Recipe Book, complete with recipes and detailed instructions on packaging products.